Is Google Shopping Finally Coming to Thailand? For those of us experienced in Digital Marketing in markets such as the UK, Australia and USA, Google Shopping or Product Listings has been around for years. As Thailand’s demand for online shopping grows, it seems that Google is now starting to take notice. For years we’ve been asking if and when Google Shopping will be coming to Thailand – to which it now seems like it may arrive sooner rather than later. 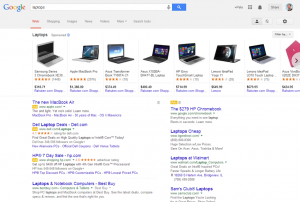 So what is Google Shopping Ads? 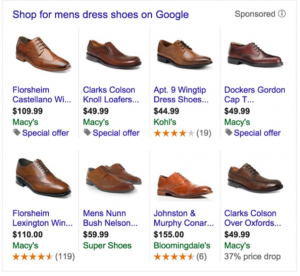 Google Shopping is an advertiser-friendly feature from the world’s biggest search engine. The algorithm incorporates clever insight into what users and marketers are looking for, blending it seamlessly into Google’s own easy-to-use interface. Google Shopping realizes that a search for “laptops” likely means that the user is interested in buying a new laptop, and is looking for information about price, quality and available options for buying online. So it presents users with a selection of suggested products from retailers which are relevant to the search request. Acting as a special branch of Google’s own AdWords system, Google Shopping directly connects users with individual products they are likely to be interested in, and presents them visually along with pricing and merchant information. That visual touch is an important upgrade from the ordinary AdWords interface. As any marketer can tell you, a well-presented product image can make an item seem much more ‘real’ and available than even the best of plain text-descriptions can – especially when the rest of the screen is filled with other text as well. The result is an impressive – and sometimes massive – return on investment for Google Shopping advertisers, who can turn their ad spend into sales of 300%-500% or more through a well-run campaign. Users seem equally happy with the service, as click-throughs and purchases continue to rise year-over-year in countries where the Google Shopping feature is available. Retailers overseas have already seen clicks from Google Shopping overtake clicks from standard AdWords Search campaigns, with mobile phones as the most successful platform for the new service. Advertisers on Google Shopping must manage their campaigns through a combined use of AdWords and Google Merchant Centre. Many familiar tactics remain the same, such as the concepts of bidding and SEO strategies, but some new concepts exist. Rather than having full control over the specific keywords that activate your ad, Google’s artificial intelligence system automatically sifts through several variables to determine when your ad is seen. As a whole, Google Shopping’s simple, point-and-click interface makes for a smooth and encouraging improvement in the online advertising experience. If you’re looking for further information on Google Shopping in Thailand, or some general advice on how to best market your business online, then get in touch with Phoenix Media today on 02 038 5400 or email info@phoenixmedia.co.th.